Upgrade your old washing machine to a high efficiency clothes washer that uses up to 55% less water and gets clothes just as clean. Less water means less energy needed for heating water, which can help lower your energy bill as well. When almost 15% of the water used inside your home goes to doing laundry, high-efficiency savings make it a no-brainer! 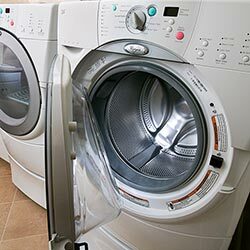 Click here for a list of rebate-eligible clothes washer models.